You guys. I’m so annoyed with myself right now. I can’t even believe I did this. That is my precious, delicate, fragile Missoni fabric. 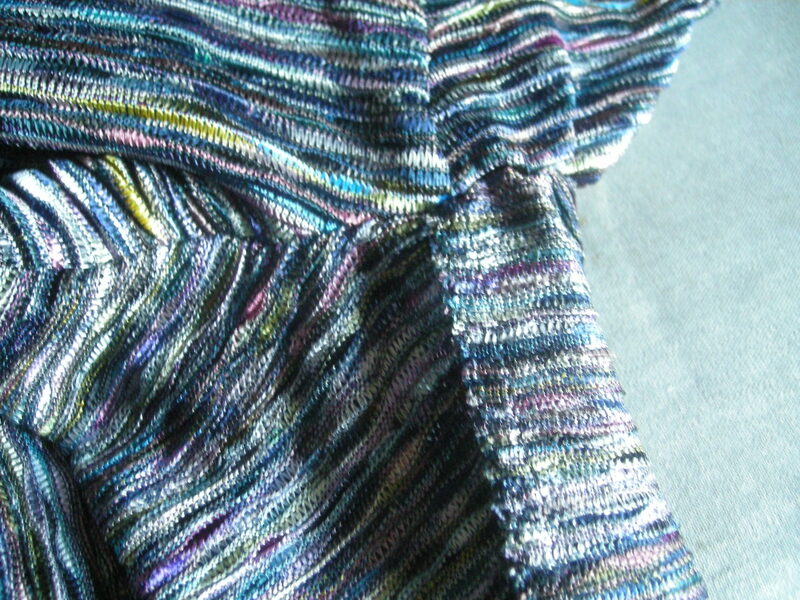 That is a sleeve sewn inside-out to the body of the garment in my precious, delicate, fragile Missoni fabric. What you can’t see from this photo is that I already very carefully trimmed, graded, clipped, and finished the inside armscye seam. Yes, somehow without realizing that the entire mumble-mumble sleeve was inside out. (Insert many curse words here.) Trying to pick it apart has resulted in tiny puffs of multicolored fabric shredding all over everything. I do have enough fabric leftover to re-cut the sleeve, but I have to try to preserve the body pieces as best as I can, and it is not going well. 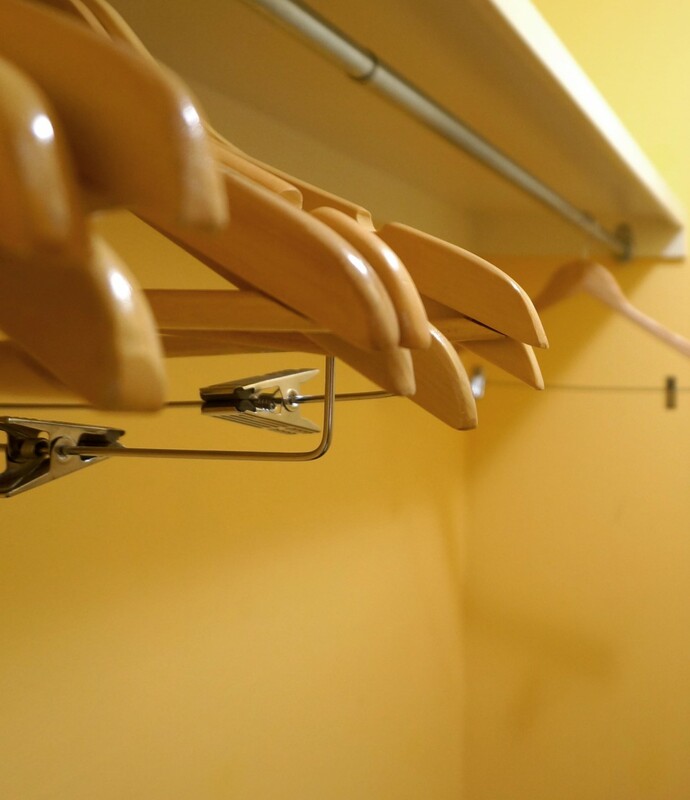 So the project might just have to take a time-out in the closet to think about what it has done and realize that it should be very, very sorry. Let’s think happy thoughts for a moment. Here’s one. 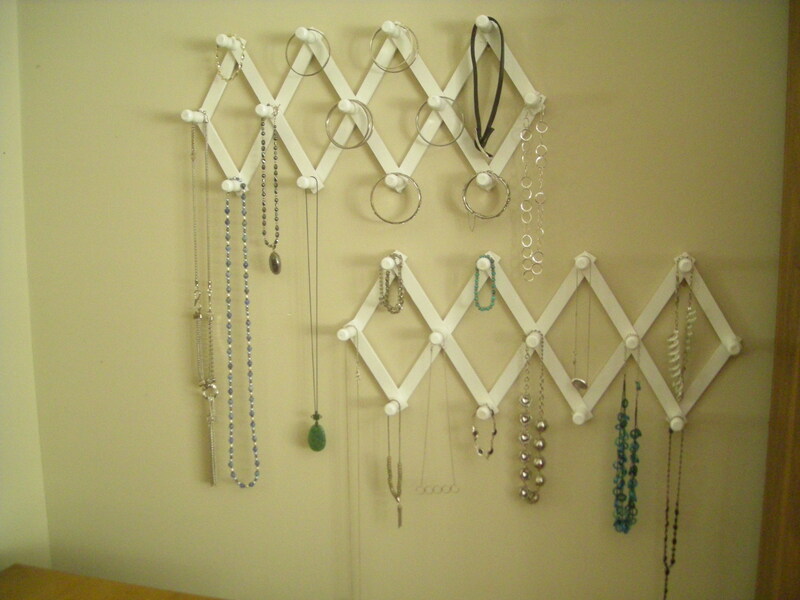 I hung the mug rags for my jewelry. This isn’t perfect yet — I’m still sorting things and trying to figure out the best way to cluster things on each peg, so only about half my pieces are hanging here so far — but it gets the tangle off my bedroom mirror and dresser top. It’s not neat, exactly, but it’s a heck of a lot neater than it used to be, and it has made trying on necklaces so much easier. And why was I trying on necklaces, you ask? I lucked into some last-minute tickets to see Renee Fleming in Capriccio at the Lyric Opera. I’m not exactly an opera buff (I like it for the spectacle, but prefer good old drama), but I think Renee Fleming is a magical performer, and there are only four performances of this opera. I can’t believe we got tickets, and even managed to get a bargain on them. We decided to have a great dinner at Lloyd’s before the performance, which was a real splurge when you’ve been on a diet for almost 16 straight months. So it was a real event, and I was thrilled to be able to wear these pants. There’s a little story behind these pants. 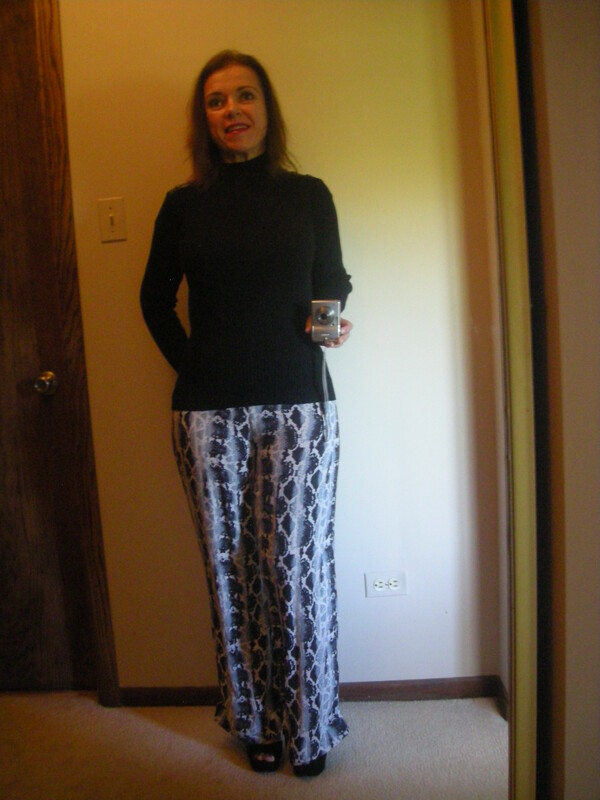 Those are snakeskin-printed palazzo pants that I bought back in May and probably spent too much on. They didn’t fit me then, not even close. They were more like leggings than flowing challis pants at that point. I almost didn’t buy them, even thought the style is SO ME. They were pricey, and I was afraid I wouldn’t lose enough weight to wear them, and they’d be that thing every woman dreads — a too-small garment, new tags still dangling, rebuking her from the back of the closet for the failure to make a goal. Every year, my brother and his wife host a themed Halloween costume party. This year’s theme is 80s movies. There were a lot of really fun movies that came out in the 80s, but for so many of them, the female characters just wore street clothes. Think about it. My first thought was Valley Girl, the old Nicolas Cage romance between the punk and the prep. What did the girls all wear in that movie? Skirts. Tees. Ballet flats. They were all styled in a strongly 80s way — bright colors, huge shoulders — but they were basically street clothes, not so much costumes. Ditto for most of the John Hughes movies. There are some strong looks in those films, but none that I really felt were special enough. And then I had my aha! moment. Can you guess my 80s movie character from this? I’ll give you another hint. I will spend all night fighting the urge to sing, “Mr. Mango on my shoulder” to the tune of Zippety-Do-Dah. 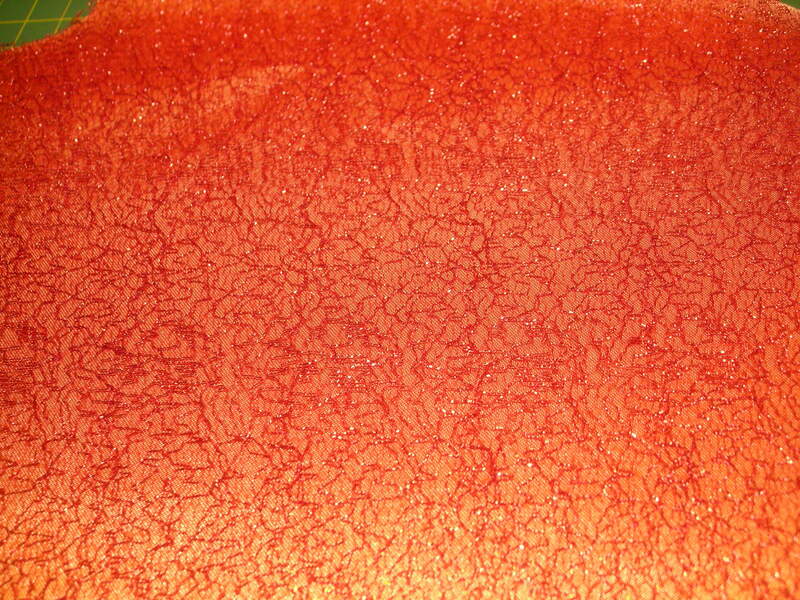 Let me give you the close up on this fabric, because it’s pretty cool for cheap costume junk. 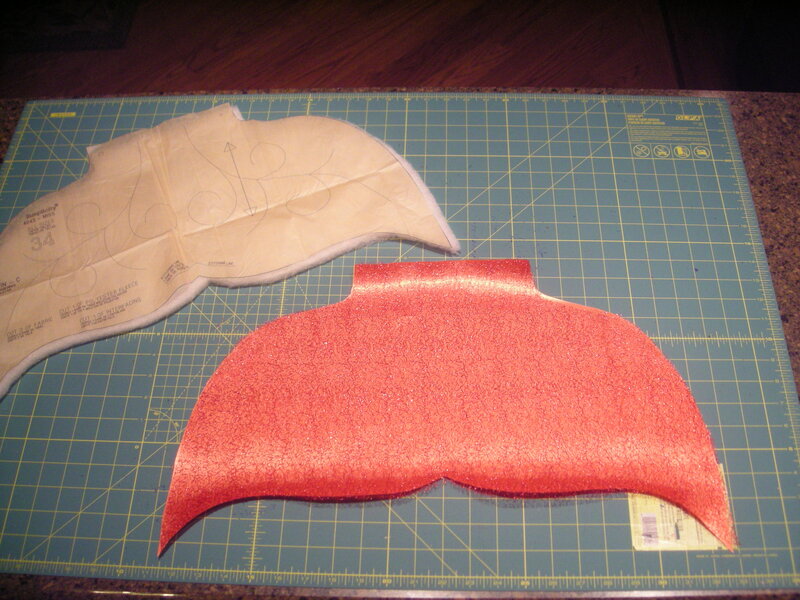 I’m layering this scratchy, awful red metallic mesh stuff over a stiff, awful, cheap orange satin, and … magic. It almost looks like fish scales. Believe it or not, this is the second time I’ve made this pattern, so it should go pretty quickly. One hopes.